5 Ideas for homemade flower gifts to brighten up her Valentine’s Day! What to give to your beloved on Valentine’s Day? Many people face this question in the days before 14th of February. Would he or she like a gift without words to express feelings, something original, exclusive and memorable? 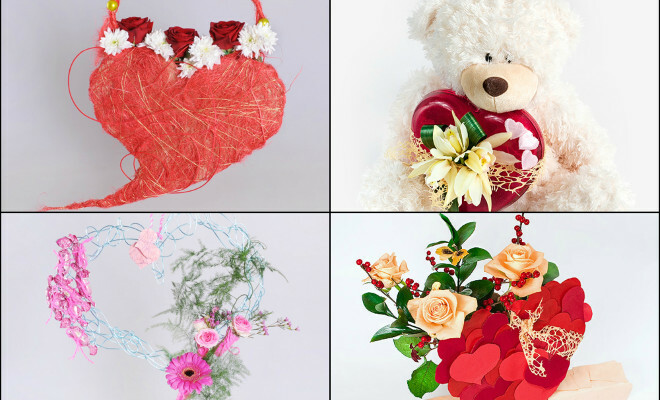 We want to offer you some original ideas on making flower gifts in a symbolic heart shape. It will become a wonderful decor for your romantic evening, as well. 1. 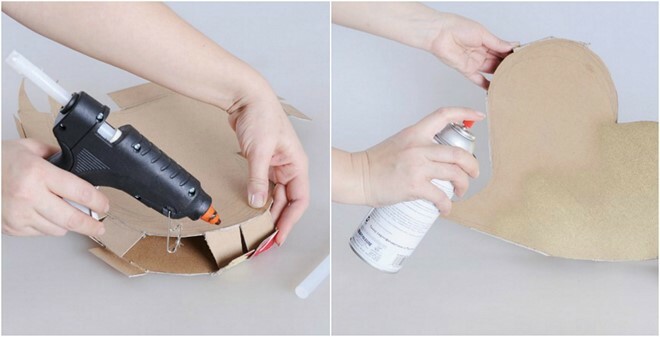 Start making the cardboard handbag. 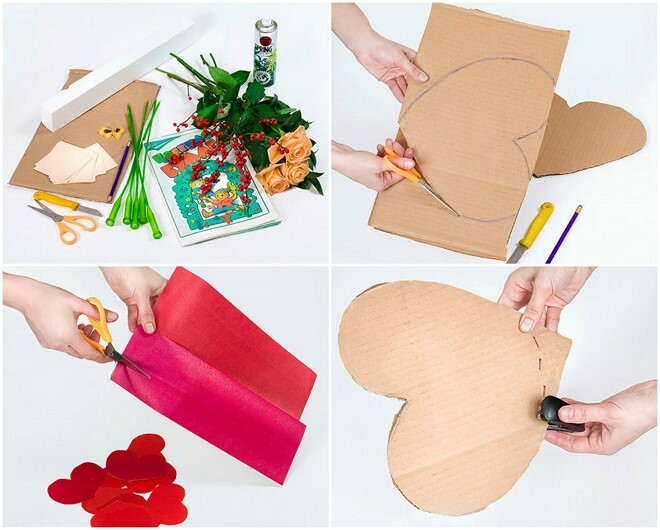 Fold the cardboard in half and draw а heart (about 25 cm wide). Let it be asymmetric, with a “tail” going away. Draw on the sides several flaps so that you can glue the two cardboard pieces together. Cut out both hearts along the lines. 2. Place both heart shapes together, bent the flaps inwards, apply glue and let dry. 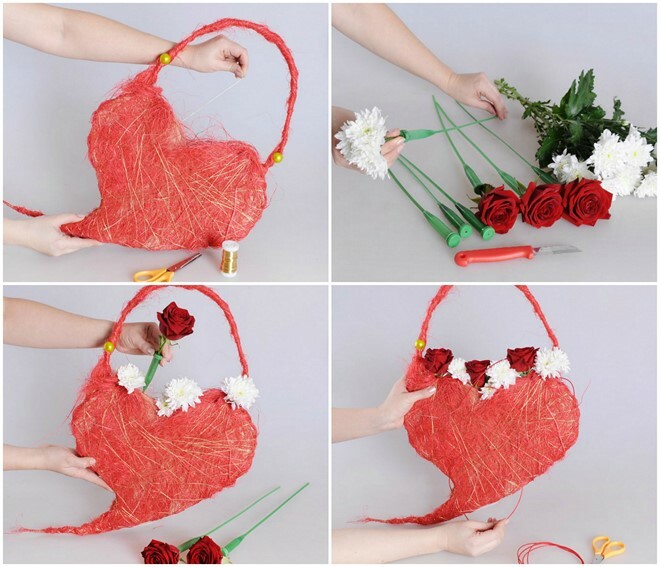 In this way you will create the heart-shaped bag. It must have a certain volume and be empty inside so that you can insert the flowers. 3. Spray the surface of the cardboard bag in gold. 4. Now make a handle for the handbag out of a thick wire. Using the wire cutters cut a piece of wire about 40 cm in length and bend it in half. Thread a green bead on the wire and move it to the place where the wires are bent. Make several turns of twisting to fix the bead in one place. At the other end of the “handle” put on another bead and also fix it in one place, connecting the wire ends. 5. When the gold spray has dried, begin decorating the “heart” with sisal, evenly gluing it on all sides using the glue gun. 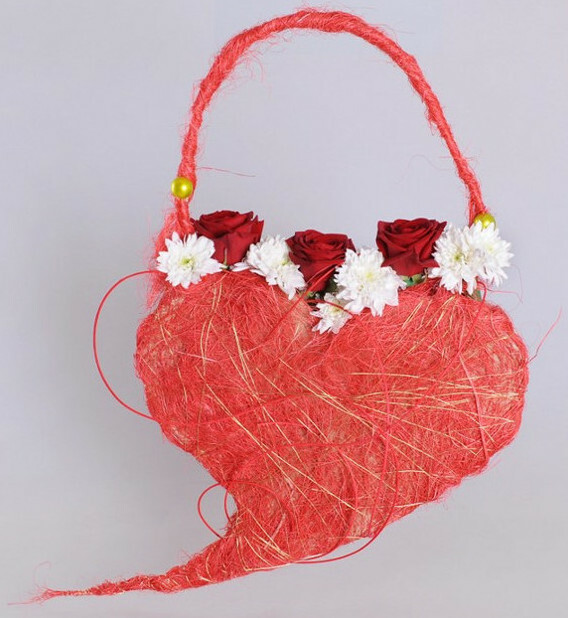 Bend the wire with beads in the form of a horseshoe, wrap it with a red sisal and glue it to the cardboard handbag. Try not to hide the beads on the handle under the fiber. 6. Handbag will be nicer if it is wrapped in different directions with a thin Bullion wire. In addition, the sisal will hold on to it more tightly and dissipate less. Try to make the “tail” of the heart pointy by carefully wraping it up. The handle is attached to the purse with the help of the same Bouillon wire. You can also wrap the Bouillon wire around the entire length of the handle. 7. Using the knife, carefully cut flowers (the length of the stem left should be about 10 cm). Then fill the flower picks with water and insert the flowers. From the Chrysanthemums you can place three-four flowers in one pick. 8. Using short nippers, shorten the plugs of the cones. Then we put the flasks inside the bag, alternating red roses and white chrysanthemums. 9. To give the composition originality, we will decorate the handbag with mini-rings. Using hot melt we fix the ends of the segments of “rings” under the fibers of sisal. 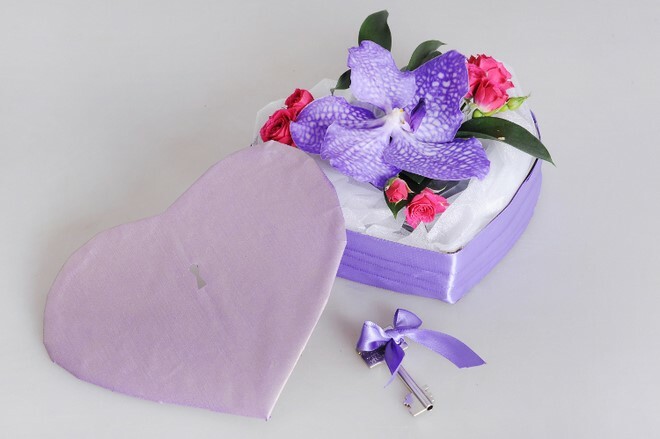 And your heart-shaped flower gift is ready! It will create a holiday atmosphere and will certainly please the person for whose sake it was done. And this is natural, because this gift is significant, when you present it, you present your heart to a loved one. To tell a person about your love, you can say it with a few words. To present a symbolic gift made by you – this will be the most eloquent expression of your feelings. 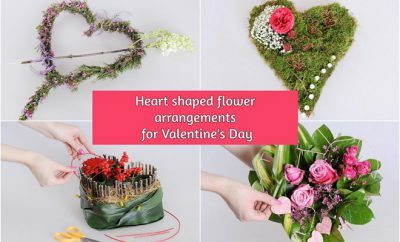 And it is not necessary to wait for Valentine’s Day: when you want to make something pleasant for a person, you can use any occasion or even invent it yourself. Unexpected gifts are no less expensive, as they demonstrate genuine care, which does not need reminders and red calendar dates to show itself. 1. First, draw a heart on one of the cardboard pieces and cut it out. Then use this as a template: lay it on the second sheet of cardboard, trace it and again cut out. 2. And now, using red paper of different shades, cut out about 30 small hearts. They may differ slightly in size. 3. 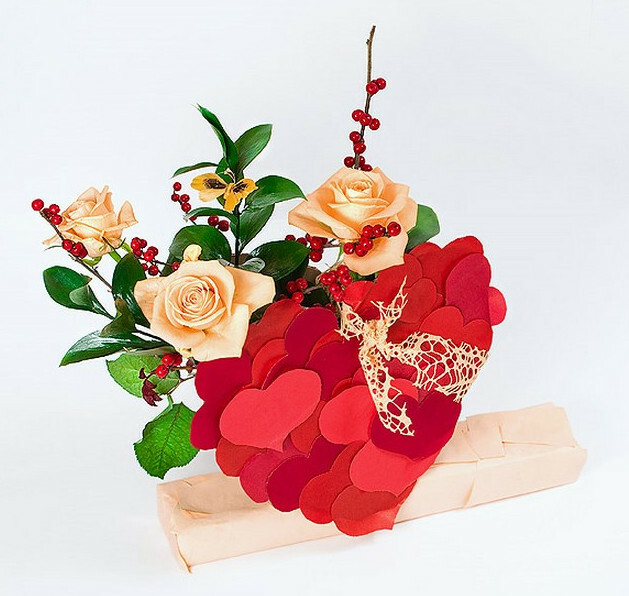 Attach the two cardboard hearts together with a stapler in the lower part and partly on the sides. 4. With the help of craft glue and paper notes decorate a block of styrofoam, gluing it arbitrarily from all sides, except the bottom. 5. 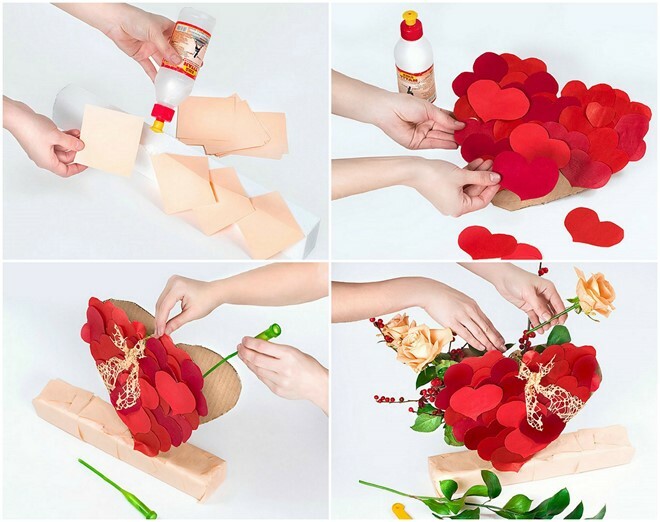 Glue the small red hearts on both sides of the cardboard. Start gluing from the top down, partially overlapping the next row of hearts over the previous one. 6. Attach a decorative lace bow in the top left corner of the finished heart. It is desirable that it coincides in color with the roses. Next, fix your heart on the foam stand. To do this, make a cut on the styrofoam block and insert the cardboard heart. 7. Pour water in the picks and cover them with the lid. Cut roses, ilex and ruscus and insert them in water tubes. You can arrange the flowers in different ways – this is a matter of your taste – but in our opinion, it will be more beautiful to look at the asymmetric version presented on the photo. 8. And now the last decoration: attach the butterfly on the wire to the branch of Ruscus – it will look good on the juicy dark green. (The butterfly can be replaced by a small bumblebee or dragonfly). 9. 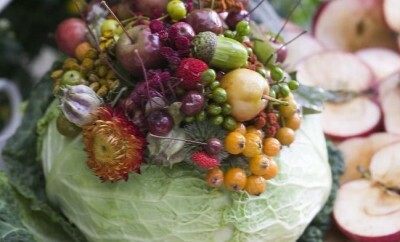 With the help of a floral spray, we give the greenery a brightness and a juicy radiance. Our romantic composition is complete! Agree, it is able to impress and cause positive emotions in a person who is dear to you! And can it be otherwise, because the composition is made with soul – and this is immediately evident. Which girl does not like soft toys? Especially, if it’s a cute teddy bear, holding a red heart with flowers. It is such an adorable gift! a large decorative heart and several small fabric hearts. 1. In the beginning, you need to prepare the flowers of the Cymbidium. Briefly cut the orchid flowers with a sharp knife. Prick the pedicel of the cymbidium flower with a piece of floral wire. Work neatly, do not damage the flower itself. Put a small piece of damp cotton wool on the place of the flower cut and wrap a part of the pedicel and wire with floral tape. 2. Cut off a piece of decorative mesh. Tie the big heart to the soft toy, placing it between the front paws of the bear and finish with a big beautiful ribbon. 3. 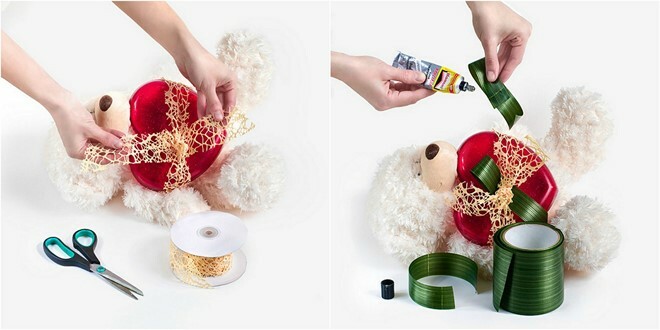 Cut the green leaf ribbon into several small pieces. 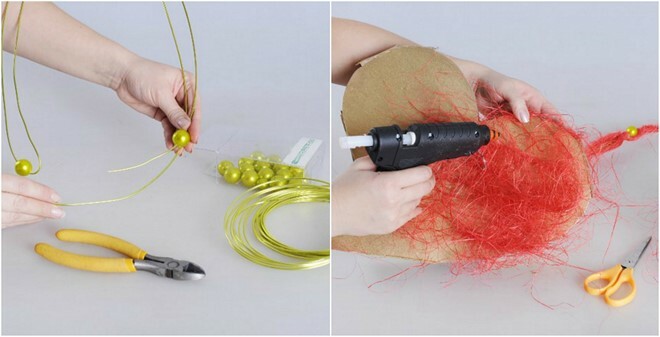 Form an improvised bow, gluing each of the pieces directly under the knotted mesh bow. 4. Take the flowers of the Cymbidium orchids. The wire stems should be short, not longer than 10 cm (4 inches). Secure the flowers to the heart. To do this, carefully thread the wire stems under the bow. If necessary, cut the ends of the wire. 5. Glue several small hearts on the edge of the big heart. 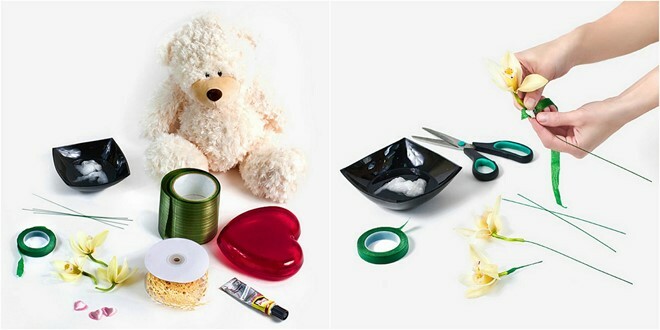 It remains only to wait for the glue to dry completely, and our touching teddy is ready to tell about your love. Instead of Cymbidium orchids you can use roses, mini-gerbera or carnations. 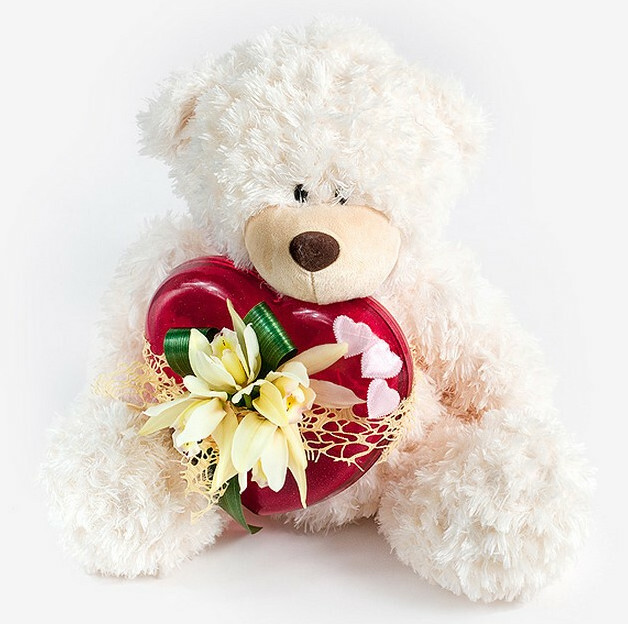 Such a Teddy bear will be just a great gift for Valentine’s Day! 1. We will make our heart shaped box from cardboard. Cut out two identical hearts – the lid and the bottom, and also cut off a piece of cardboard strip, which later becomes the walls of the box. Cut it so that you have roughly 1/2 inch excess. This way it will be more stable. 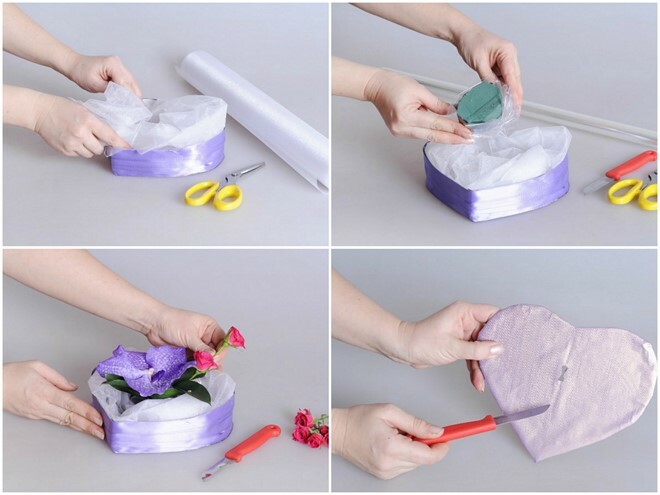 Then, wind lilac ribbon round the box until the cardboard is fully covered. 2. 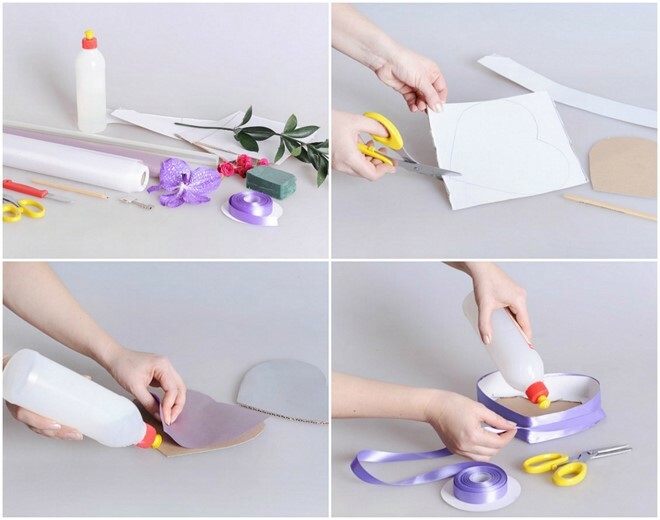 Wrap the lid of the box with decorative paper. 3. Now we need to fold the strip of cardboard (box walls) into the desired shape and glue it to the bottom. 4. Put in the box a sheer fabric. In the center of the box there should be an empty space, where you will place the floral foam with flowers. 5. Soak the floral foam in water and wait for it to sink to the bottom. Now wrap it in foil so that water does not flow from it. After that, lay it in the center of the box. 6. Insert the flowers into the floral foam. Now they will stay fresh longer. 7. On the cover of your box with a pencil draw the contours of the keyhole and cut out. 8. 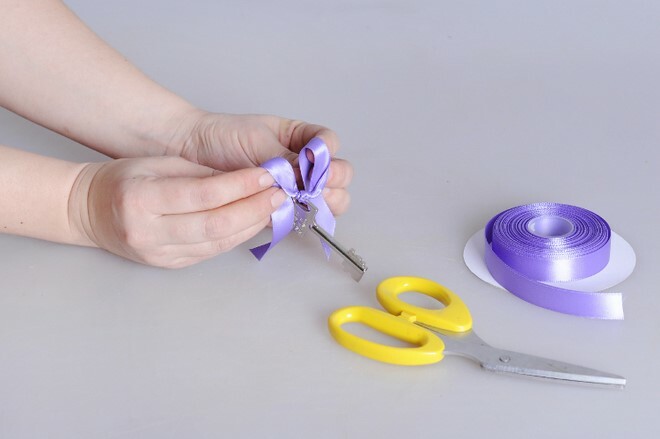 Now you just need to decorate the key for the box with a pretty lilac satin ribbon. 1. First of all, make two wire bases in form of hearts of different sizes and intertwine them with each other using more wire. 2. 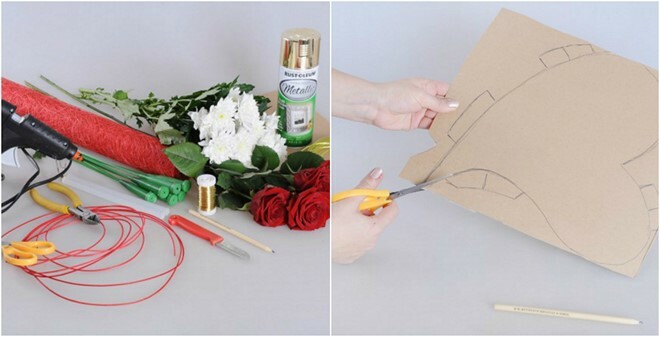 Wrap the water tubes for flowers with yarn so that they can become a decorative element in your composition. 3. 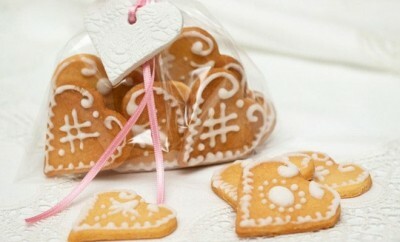 Cut out small paper hearts and wrap them with Bullion wire. 4. Make a loop from wire for hanging the heart on the wall. To decorate the wire, wrap the loop with pink yarn. 5. Secure the loop and the water tubes on the heart. 6. Pour water into the water tubes and insert the flowers – a gerbera, shrub roses and greens. 7. Using yarn thread attach candies to the upper left corner of the heart. The heavier water tubes with flowers should be placed below, and the light candies – in the upper part to balance the composition. 8. 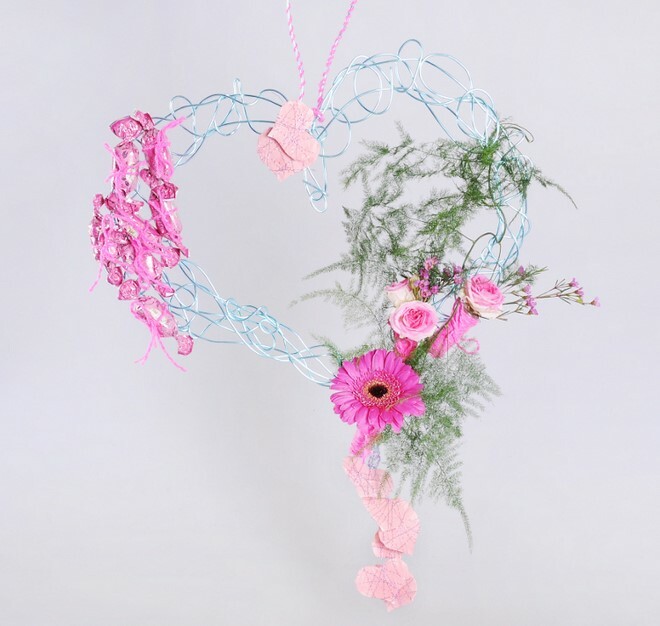 Make a small garland of pink paper hearts and hang it at the bottom of the wire heart. With such a wonderful decoration, you will be able to create an indescribable atmosphere in your home. And of course, this gentle and stylish wall art will not leave your loved one indifferent.